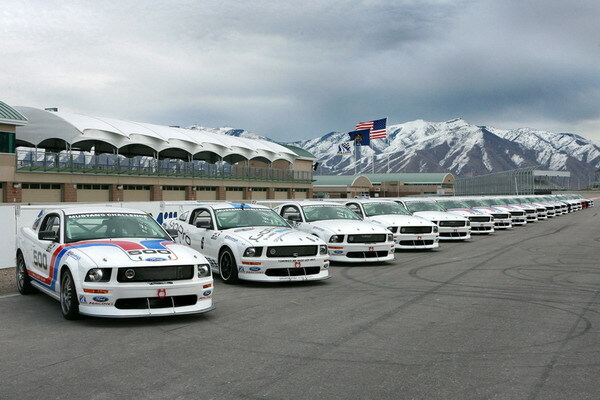 SALT LAKE CITY, Utah (March 5, 2008) – The inaugural Ford Mustang Challenge for the Miller Cup racing series held its first official event this past weekend with 19 entrants taking delivery of their new Mustang FR500S race cars in a special program at Miller Motorsports Park. Participants also had the opportunity to attend the Ford Racing High Performance Driving School, meet series officials, receive technical information from Ford Racing engineers and shake down their new race cars for the first time during the open track sessions on both Saturday and Sunday. “The Mustang was a dominant showroom-based race car during the glory days of American road racing in the mid-1960’s and ‘70’s and this car certainly continues that proud tradition,” said Jamie Allison, manager of the Ford Performance Group. “Our intent was to develop a fun-to-drive reliable race car that delivers on what people have come to expect from a Mustang – V8 power and rear-wheel drive performance at an affordable price, and I think we’ve accomplished that with the FR500S. The FR500S was co-developed by Ford Racing Technology and Miller Motorsports Park and is the newest addition to the Mustang FR500 racing family. A total of 77 cars were manufactured at AutoAlliance International in Flat Rock, MI, with additional race-prep fabrication at Watson Engineering (Taylor, MI) and final race prep at Miller Motorsports Park in Tooele, UT, the FR500S is the first race car built by Ford Motor Company at a production facility intended for sale to the public. For more information about the Ford Racing Mustang Challenge for the Miller Cup or details on how to purchase a Mustang FR500S, please visit www.MustangChallenge.com. Lexus HS 250h Hybrid Increases Production, Headed To U.S.